The fourth show that went on sale this morning has now sold out. 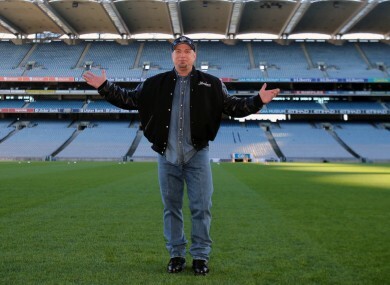 GARTH BROOKS will be playing a FIFTH date at Croke Park this summer. Tickets for the show on Tuesday July 29 – the fifth successive night after concerts on Friday, Saturday, Sunday and Monday – are on sale now. The date was announced this morning after tickets for Brooks’ fourth show, which went on sale at 9am, sold out in minutes. If the fifth show sells out too, Brooks will play to a total of 400,000 people – or just under one-tenth of the population of the Republic of Ireland – over the giant comeback event. Email “Garth Brooks has announced a FIFTH date at Croke Park”. Feedback on “Garth Brooks has announced a FIFTH date at Croke Park”.